MoD ARZENÁL Ltd. is dealing with the modernization of AK-63F assault rifle since the beginning of 2013. During the development we replaced the original case cover for a new, self-made case cover, which contains the NATO STANAG 4694 compatible rail used by NATO. The wooden back grip was changed to CAA UPG-47 type plastic pistol grip, the wooden stock to a CAA CBS & ACP plastic adjustable stock and the wooden first grip was replaced by a unit with three NATO STANAG 4694 compatible rails and a first rail cover. The design of the modernized assault rifle provides the mounting of modern targeting devices and other accessories, thus it creates the possibility of prompt and accurate firing during day- and nighttime, under extreme climatic conditions. 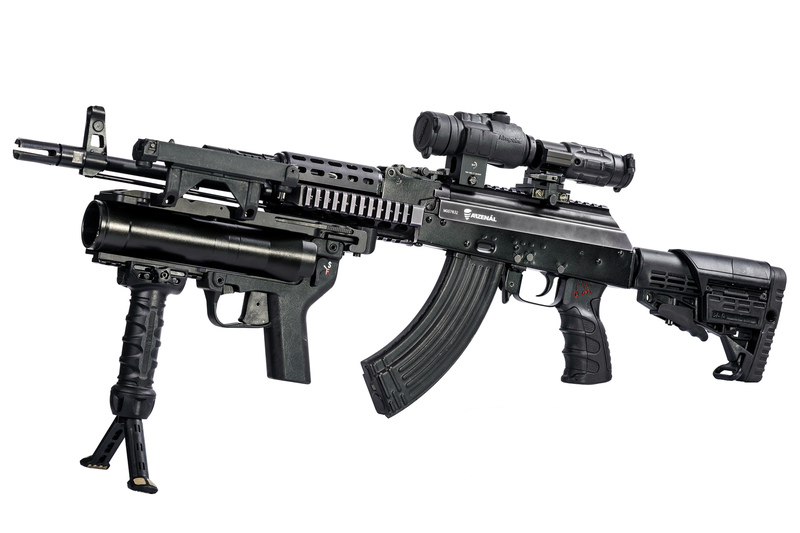 The modernized AK-63MA assault rifle can be equipped with the followings: HK 416 40x46mm underbarrel grenade launcher, Aimpoint Comp M3 2 MOA laser optical sight, Aimpoint 3x MAG magnifier, LLM01 laser light and Night Optics D-740 night vision device. As a result of the modernization the weapon became slightly heavier, however it has improved operational applicability compared to the original assault rifle.